A depressing trend in sci-fi and fantasy video games is developers’ over-reliance on grim, brown-and-grey visuals to present a world in decay. Sometimes it seems as though art directors’ reference points began with Alien and end with Aliens. So whenever a game like Trine—downloadable for Windows and the Playstation Network—embraces a vibrant color palette and an appreciation for the wondrous as well as the grotesque, you have to take notice. 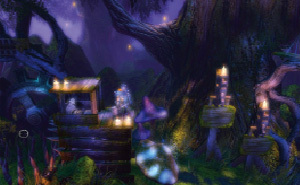 Trine’s high-fantasy milieu is drawn with rich colors and fantastical backdrops: Deep green vegetation grows upon purple rocks, and orange lanterns cast a soft glow that bounces off steampunk-inspired architecture. This game world isn’t just colorful—it’s gorgeous. Gameplay takes the form of a classic side-scrolling platformer. Each level consists of a combination of environmental hazards and enemies, and no one character can traverse the world on his or her own. (A single player can switch between characters on the fly, or up to three people can play cooperatively.) The levels are designed cleverly enough that any character can use his abilities to solve a problem, but there’s often an optimal strategy. This leads to more lateral thinking than is common for games of this type. It also leads to forehead-palm moments—like when you spend five minutes conjuring boxes and attempting to place them just so, before realizing that there’s an attach point for the thief’s grappling hook at the top of the screen. One of Trine’s would-be selling points is its physics-based puzzles, but history has taught us by now that “physics-based” is often a euphemism for “capricious”—and that’s the case here. For as much as Trine succeeds in the realm of the fantastical, its reliance on allegedly realistic depictions of gravity and inertia is its downfall. Many of the environmental hazards require the player to manipulate an object’s momentum or place it ever so delicately in exactly the right spot. Unfortunately, the rigorous physics engine treats every object like a rubber ball. Levitate a crate to move onto one side of a balancing scale, and you will find that the crate starts spinning in midair. Set it down too far from the center of the dangling platform, and it will tip and slide off. If it lands on an incline, it will tumble downhill and off the screen. This isn’t just difficult—it’s actively working to subvert the player’s intent. Trine is frustrating because in so many ways it seems to be the type of game we need: It’s concerned more with indulging the imagination than exploiting our baser instincts, it asks as much from our brains as it does from our reflexes, and it has a sense of humor. If it could just master the basic laws of physics, we’d be set.